I’ve received several requests from readers for a leaner, faster-loading version of Virtually Blind for mobile devices over the last few months, and I’m happy to announce that VB Mobile is live today. If you visit VB on a mobile device, you will now be served a highly streamlined page that shows only the ten most recent posts as text links, with no download-intensive sidebar, graphic advertising, comments, related links, or images. You’ll still have access to VB’s full content via each individual post’s page, but VB Mobile will let you check for new articles on the front page with only a tiny, 30k hit on your mobile device. 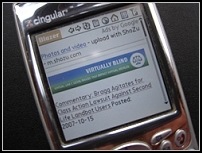 No feed reader, special address, or complex configuration necessary; just visit the site normally (at http://virtuallyblind.com) using your web-enabled phone or PDA, and if your mobile browser is supported (most are) VB Mobile will automatically load. If you happen to have a very fast mobile connection and a device that can handle the full site, there’s a link at the bottom to the non-streamlined front page that you can bookmark. Hat tip to Alex King, who wrote the core plugin for WordPress that makes VB Mobile possible. Alex is constantly updating the plugin to cover new devices and mobile browsers, so if yours doesn’t work yet, check again soon; everything I’ve been able to test so far has worked great. Big thanks also to the VB readers who tested VB Mobile over the last few weeks.